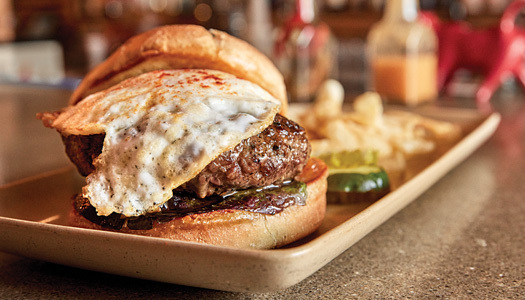 From mom-and-pop diners, hole-in-the-wall pubs, and fancy-pants kitchens all across the state, these are the juicy little beauties most worth road tripping for. Did your favorites make the list? Food editor Joe Ricchio put on over 1,000 miles and at least 10,000 calories to bring you this compendium, eating through the recommendations of Down East’s staff, listeners to his weekly radio segment, and an insistent chorus of social media gourmands. His findings? 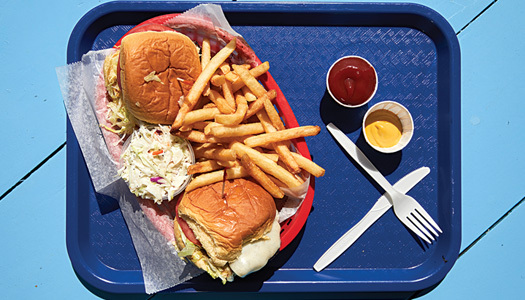 Maine’s burger-sphere is as rich and varied as its overall food scene. 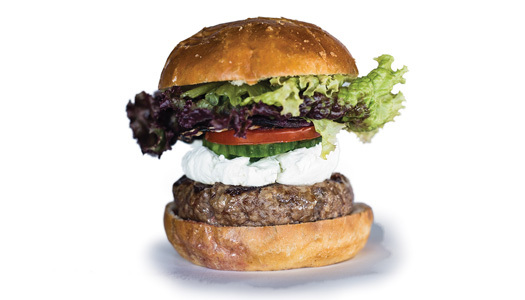 Want a burger with locally raised beef on a house-baked brioche bun with LTO plucked from the garden out back? You’ll find bushels full. 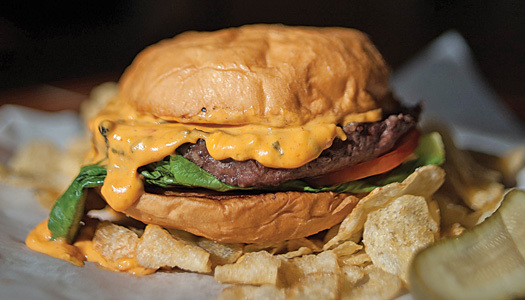 Craving the same melty-cheese slider your grandparents once ordered at a Route 1 drive-in? Pull up and flip on your headlights. 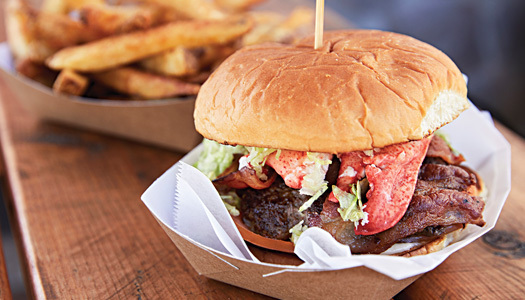 Daydreaming about a perfectly charbroiled patty with a big old lobster claw on top? Oh, finest kind, bub, finest kind. 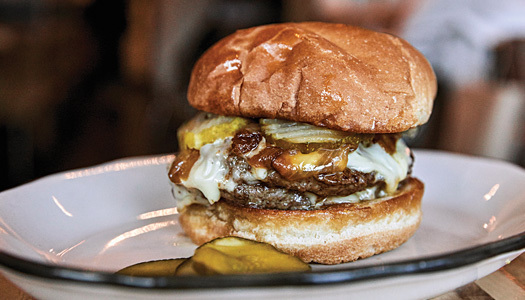 Here then, in no particular order, are Maine’s 30 best burgers. Think we got it wrong? 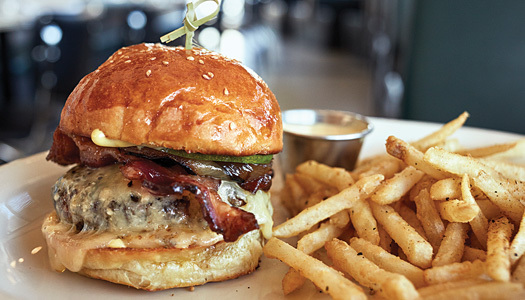 Know of a burger we missed? Comment below to let us know your beef — or weigh in on our Facebook page. 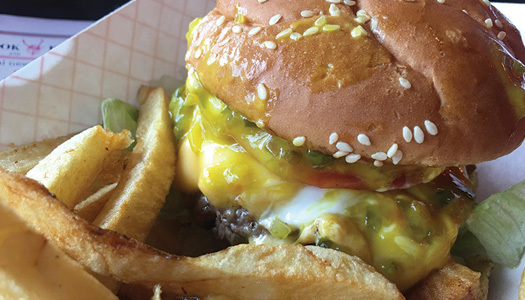 How to order hungry at this 57-year-old, cash-only roadside stand: Get two double cheeseburgers (they’re small and cheap) with everything on them (that’s sweet red relish, grilled onions, gooey American cheese, and mustard — don’t even bother asking for lettuce or tomato). Add a small fry that you should douse liberally with malt vinegar. The Harmon’s burger patty is thin and griddled fast-food style, then served on a hot buttered roll that’s cloudlike in texture and somehow even better when the heat causes little pieces of napkin to stick to it. This place hasn’t changed since 1960. There’s no need. 144 Gray Rd. 207-797-9857. 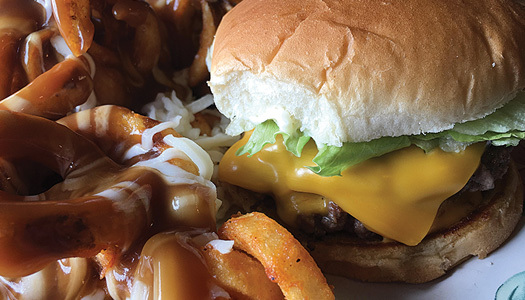 Two lean patties, ground up the road in Fort Kent, are layered with American cheese and, as the kitchen explained on our last visit, “anything else we have in the fridge that you might want.” It’s the kind of simple, nicely charred burger that makes you nostalgic in winter for barbecue season. For $3.75 more, add a side of what the locals call “mixed fry” (it’s poutine everywhere else). Fries made with Aroostook potatoes are covered with a blend of shredded cheeses and then doused with velvety gravy. 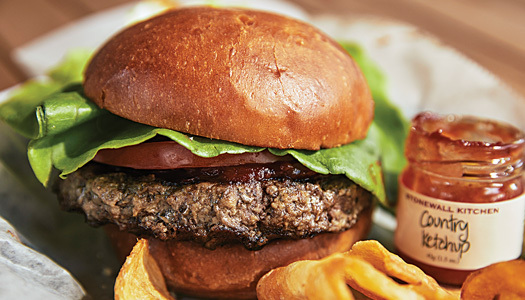 If you’re feeling it, go ahead and stack a handful on the burger. No Aroostook road trip is complete without a stop at Burger Boy, a retro diner that dates to 1968, although it’s self-consciously ’50s inside. 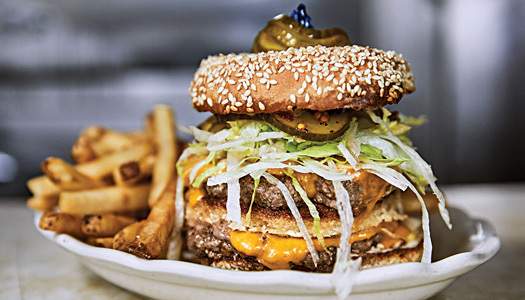 The thick, 5-ounce patty is piled high with cheese, pickles, lettuce, and tomato, all on a classic sesame seed bun (a surprisingly rare sighting on this list). 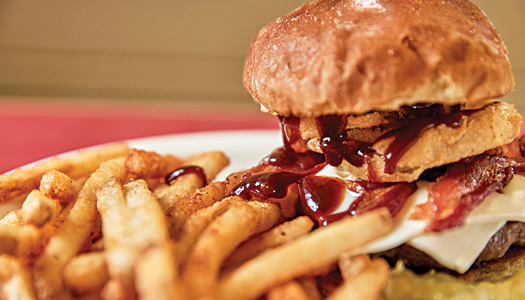 Expect toppings and condiments (generous glops of ketchup, mustard, mayo, and relish) to overflow the one-hand burger. This is where the mountain of fries comes in. 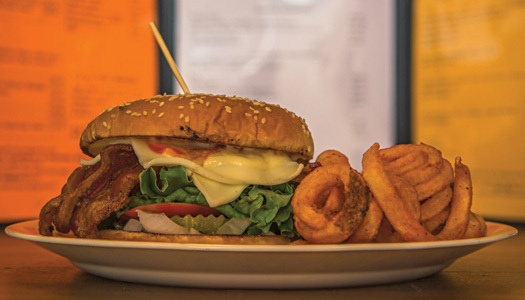 The paper basket also includes coleslaw, just like in that old cliche, “as American as a burger and fries and coleslaw.” 234 Sweden St. 207-498-2329. 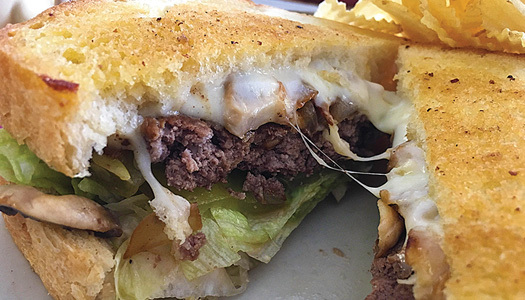 Who’d have guessed that unassuming Al’s — a vinyl booths and paper placemats kind of place on Mars Hill’s quiet Main Street — serves up the Platonic ideal of a patty melt? It starts with the thick bread, baked in-house, toasted, and well buttered. 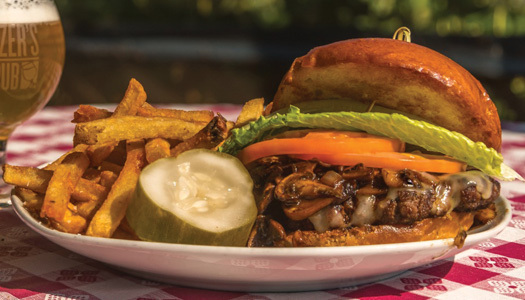 The burger patty is engulfed in stretchy, stringy mozzarella cheese and served over sautéed sweet peppers and mushrooms. Al’s “Petal Sauce” is a little like Big Mac special sauce, but with more of a bite, and there’s just a little crunch from the iceberg lettuce and tangy pickles. It’s served with ridged potato chips, and you’re going to want one of Al’s house-baked cookies. 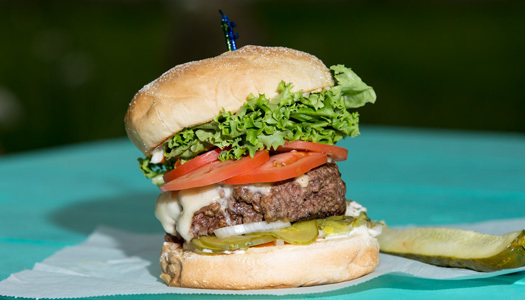 Surprisingly hard to find in Maine, bison meat has a gamey flavor and makes for a nice, dense burger. A leaner alternative to beef, it’s a little healthier, so naturally you’ll want to drape it in bacon. 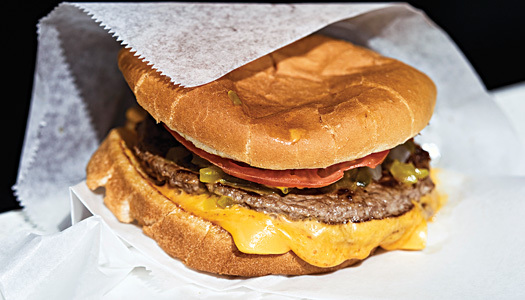 Little Melby’s — one part diner, one part convenience store — has made bison the cornerstone of its menu for decades. Find the lunch counter lined with snowmobilers fueling up on these in winter. 927 Valley Rd. 207-583-4447. The magic here is in the cheese, a blend of six different varieties, made with herbs, garlic, and chives. And since it’s finished with whatever IPA on the rotating tap handles the staff deems their fave, each batch of the creamy beer cheese is a bit different from the last. Nocturnem makes its own thick-slab bacon, should you choose to add it, and the buttered brioche bun holds it all together. Barely. As the name implies, this may not be the ideal snack to enjoy on the go. 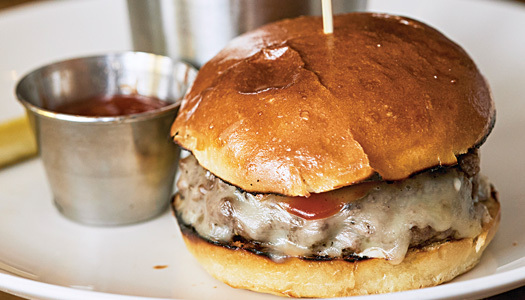 The staff in the tiny kitchen starts with a whopping half-pound of freshly ground beef, coddling it into a still-loose patty and searing it to give it a nice crust. The juggernaut of a burger is then transferred to a buttered, griddled bun and overstuffed with onions, cheese, lettuce, tomato, pickles, mustard, mayo, and ketchup. 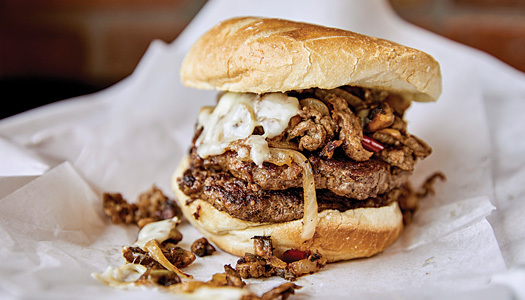 Food Network Magazine called it the state’s best burger some years back. It’s certainly among the messiest. 2 South Shore Dr. 207-596-6038. 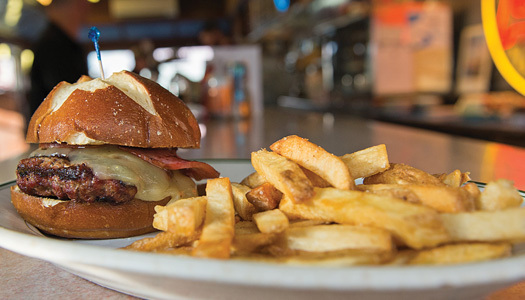 Canadian bacon and cheddar cheese on A1’s warm, soft pretzel bun would be a delightful sandwich by itself, but the inventive folks behind Gardiner’s much-loved restored 1946 dining car build this one around a nicely seasoned patty made with locally sourced beef. It comes with hand-cut fries that are perfectly crispy (but alas, south of the border in so far as they lack gravy and curds). 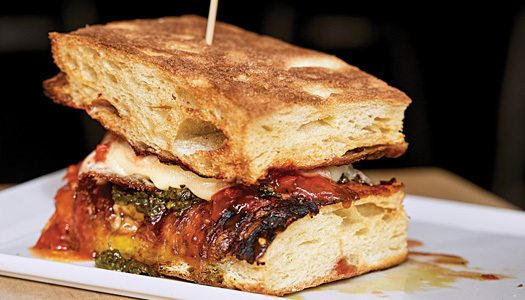 Guy Fieri is one noted A1 enthusiast, and who are we to argue with the mayor of Flavortown? 3 Bridge St. 207-582-4804. Apres-ski consumption of a “Bag burger” is practically a religious rite around Sugarloaf, and the Gucci is one of the pub’s “gourmet designer” variations (we’re also fond of the Dior and the Armani). 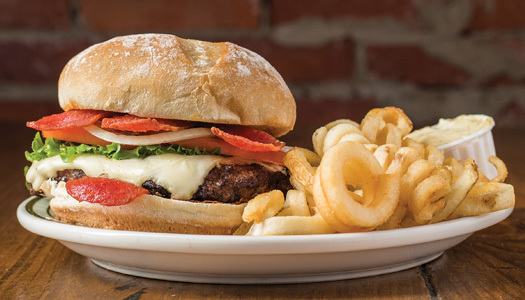 A hefty flame-broiled beef patty is topped with mozzarella and layered with pepperoni strips on both sides, an unholy union that comes on sourdough next to a bed of the Bag’s famous curly fries. 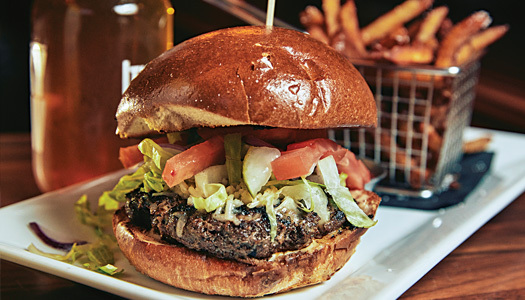 The meat is the star at Yarmouth’s quintessential village pub, a blend of ground chuck, brisket, and short rib from Maine Family Farms. 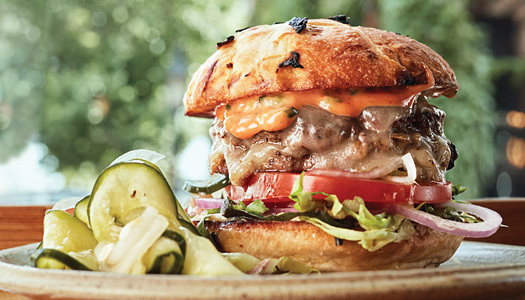 Owl & Elm laces the meat with its own steak sauce and tops the burger with smoked cheddar from New Gloucester’s Pineland Farms and a slaw of lettuce, tomato, red onion, and pickles. 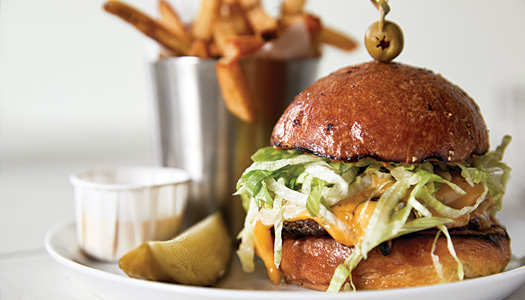 Both sides of the buttered brioche roll are slathered with garlic aioli. Comes with a funny little basket of superb house fries that you half expect to still be glistening from the deep fryer. A juicy 6-ounce sirloin patty topped with slab bacon, crispy onion rings, BBQ sauce, and American cheese, the towering Smokehouse Burger has (and needs) a steak knife driven through it to hold it together. Comes with fries, chips, (more) onion rings, or fried pickles, but the real tough choice is which of the diner’s boozy milkshakes to wash things down with. 47 Washington St. 207-490-0557.